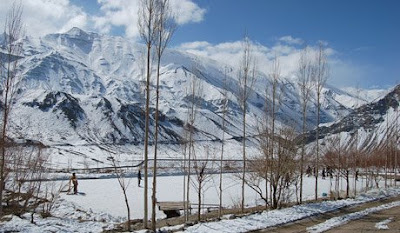 The first place I am looking to teach hockey in is Ladakh, a region in the state of Jammu and Kashmir (Yes, that Kashmir!) in the Himalayas, through an organization called SECMOL (Students' Eductional and Cultural Movement of Ladakh). "The Students' Educational and Cultural Movement of Ladakh (SECMOL) was founded in 1988 by a group of young Ladakhis with the aim to reform the educational system of Ladakh. Today our activities are extremely varied and numerous. We organize activities for Ladakhi youth, run a campus for students going to school or college in Leh, develop solar energy projects and much more. Ladakh, the eastern part of Jammu and Kashmir state of India, is a high-altitude desert region, on the upper reaches of the Indus River. Until recently a somewhat isolated rural society, Ladakh has seen enormous and sudden changes since the 1960s, when the Indian government started having an impact on local life through defence activities (Ladakh shares borders with both China and Pakistan) and development activities such as schools, offices, and subsidies. The region opened to foreign tourism in 1974, and is a popular destination for trekkers as well as travellers visiting ancient Buddhist monasteries, and since 2000 domestic tourists have been coming too. It is also home to a large Tibetan community. Ice hockey is hugely popular in Ladakh, but most kids from rural families do not get the chance to play, due to lack of skates and equipment. However, at SECMOL several dozen young people from rural villages have had the chance to skate and play ice hockey, thanks to equipment donated to SECMOL by friends around the world." In so many ways, this IS the calling I was waiting for...As I have grown and matured, and dug deep into what is meaningful in my life, a few things became clear, hockey is a sport I can't live without (I had to start with that, since this is all about hockey), we have a planet in peril that we need to protect and conserve, and there is nothing more precious than our lives and the lives of others - and Buddhism is all about working through our suffering and attaining a life of enlightenment, and by extension, peace and love. Being able to volunteer in the Himalayas, one of the most exotic places in the world, in the state of Jammu and Kashmir - which is religiously and politically divided - in a historically Buddhist community, around people that love hockey and utilize renewable energy, feel almost too good to be true. Travel will cost at least $2,500-4,000 and my living expenses will be no more than $20 day (which includes housing) that will equal $600 (I plan to stay for a month!). So I am looking for $4,000 to cover this, and anything leftover will go to additional donations/support for SECMOL. With your generosity, I want to provide more hockey resources to these people, equipment, nets, mini-zamboni (ice resurfacer), and warm clothing. Any contributions will be used towards these ends, and if you want to purchase and donate them to the cause, please do not hesitate to do so!